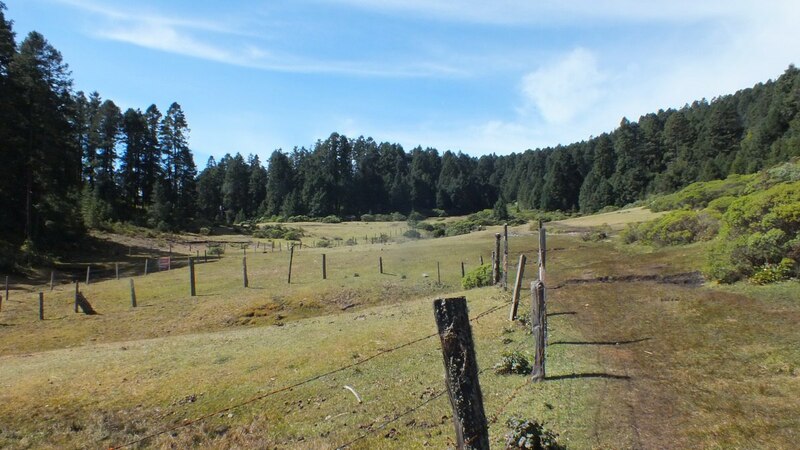 There are eight butterfly colonies that exist in protected areas of Mexico, five of which are located in the state of Michoacan, but only two of these are open to the public. We wanted to check out both for the different experiences that they provide. On Day 4 of our trip, we retraced the route towards Angangueo and then branched off towards the Sierra Chincua Butterfly Reserve. Although smaller in scope, with fewer butterflies overall, we were actually able to get closer to those resting in the trees. 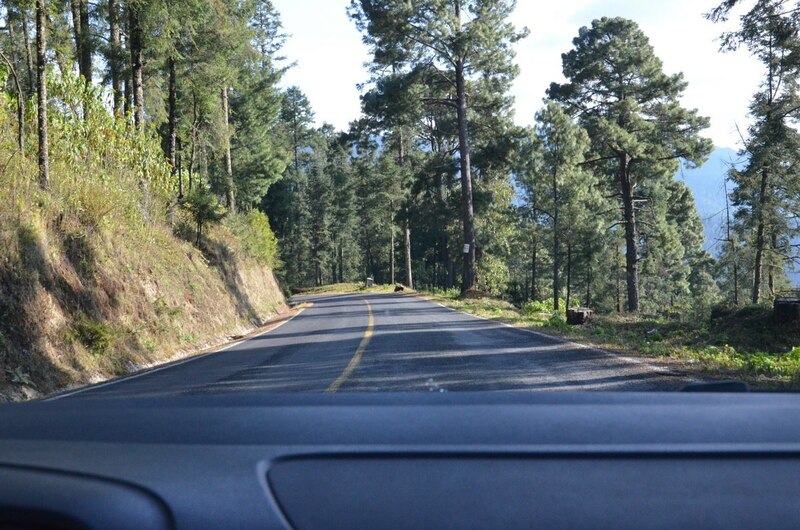 Some sections of the drive were on paved roads, yet the 1.5-hour trip from Zitacuaro was far from smooth owing to the number of speed bumps (topes) along the route. Bob had to constantly watch for these hazards that somehow always seemed to be unpainted or hiding in the shadows. More than once, my teeth were jarred when we unexpectedly bumped over one. 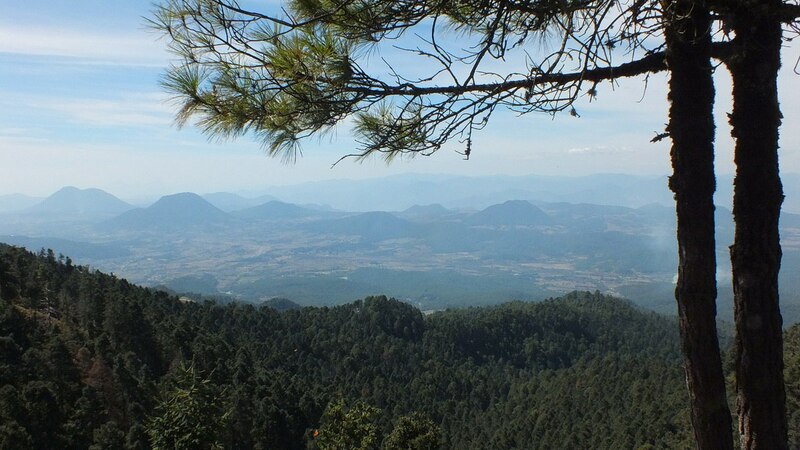 Sierra Chincua Butterfly Reserve is part of the Monarch Butterfly Biosphere Reserve that encompasses 56,000 hectares of pine-oak forest on the border of Michoacan and Mexico States. Butterflies occupy only a fraction of this World Heritage Site, about 5 hectares, between the months of November and March each year. About 8 kilometres north of Angangueo, the turnoff to Sierra Chincua is marked by a sign…. and gatekeepers directed us onto a narrow dirt road. 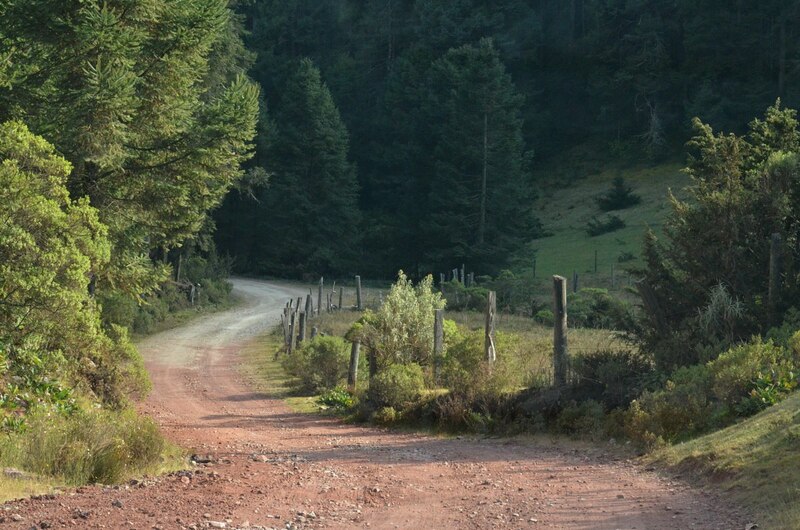 At that point, we paid $45 (45 pesos) for the privilege of driving a further 1.5 kilometres into the Reserve. 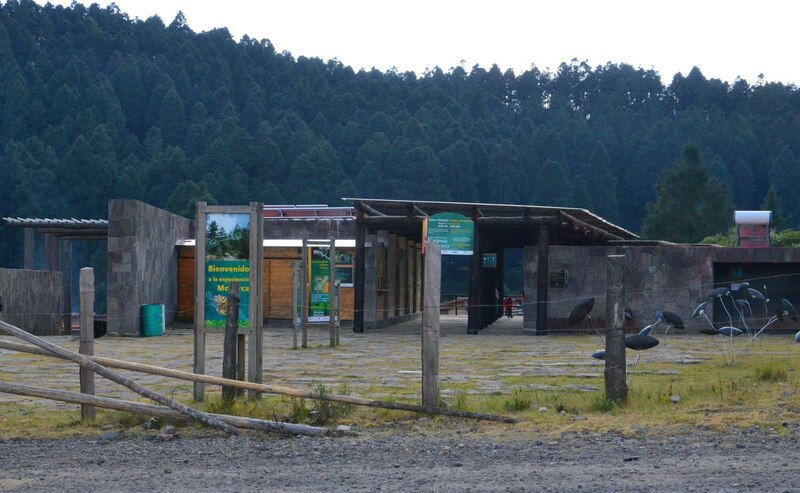 The fee essentially covered the cost of parking, which was free at El Rosario and Cerro Pelon. When Bob and I arrived at the modest pavilion marking the entrance, one other car sat alone in the parking lot. 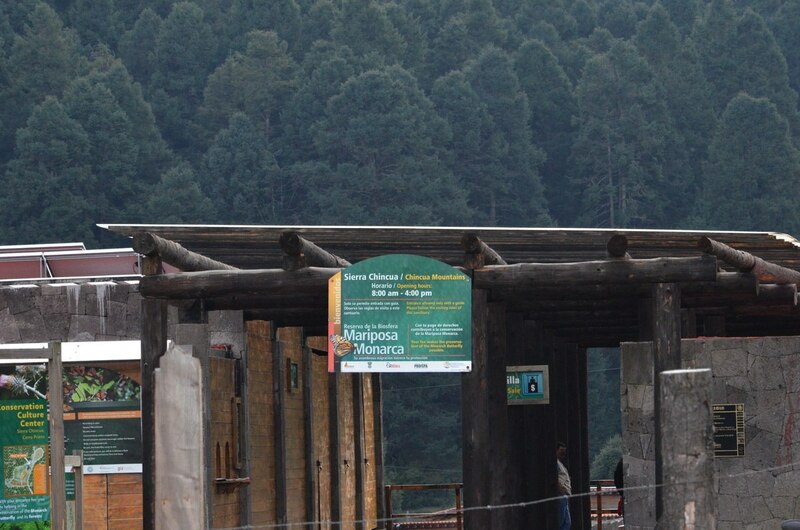 Like at El Rosario, the admittance fee was $45 (45 pesos each), and a discretionary tip was given to the guide who escorted us into the woods, albeit at the end of the day. Around the property just beyond the administration building, there were numerous open-air eateries and market stalls selling all sorts of arts and crafts. 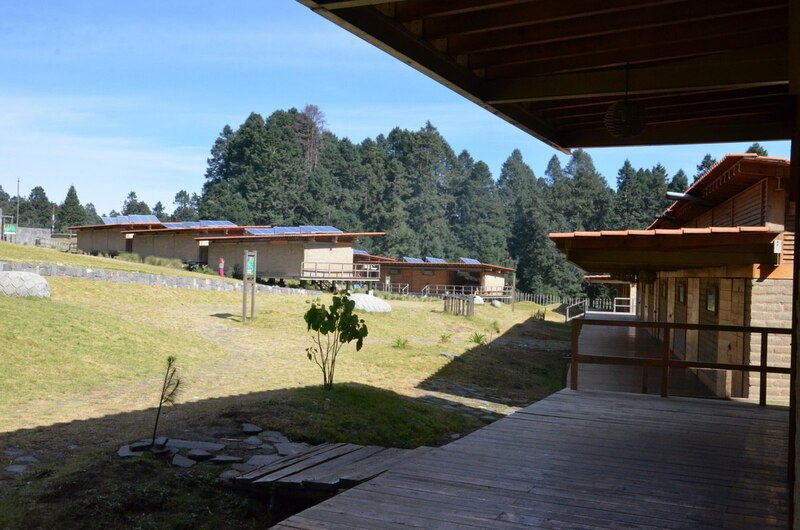 A research facility dedicated to Monarch Butterflies and a nursery that supports reforestation efforts were also housed on the grounds. 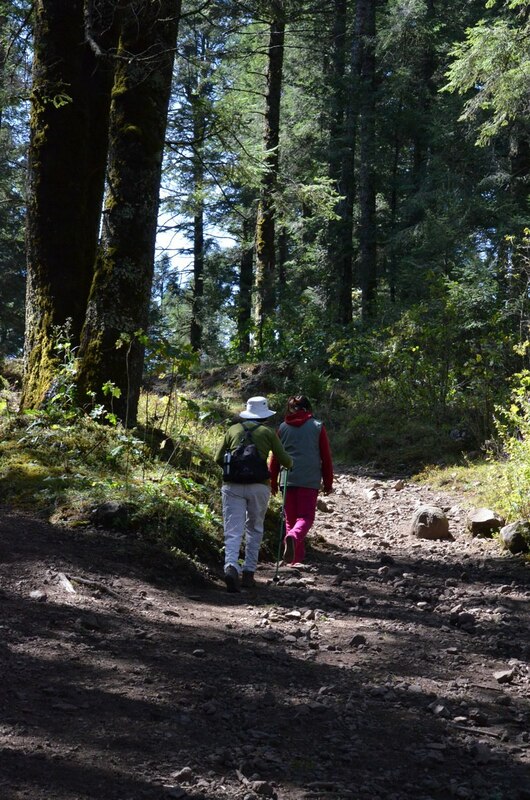 Because the hiking trail at Sierra Chincua is less steep than at El Rosario, we again chose to walk rather than hiring a horse to carry us. It was expected to take 45 minutes to reach the colonies of Butterflies high up in the mountains. 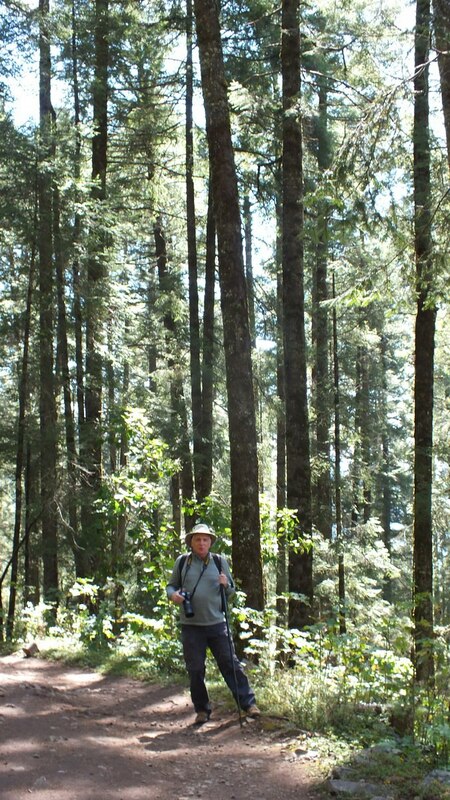 First, we crossed a level area of open grassland surrounded on all sides by a thick growth of evergreen trees. 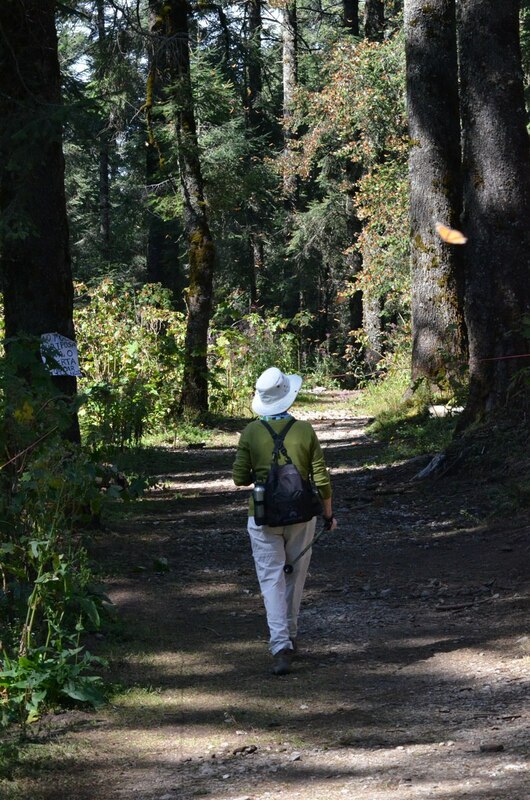 Soon, our guide led us onto one of many trails that disappeared into the shady woods. 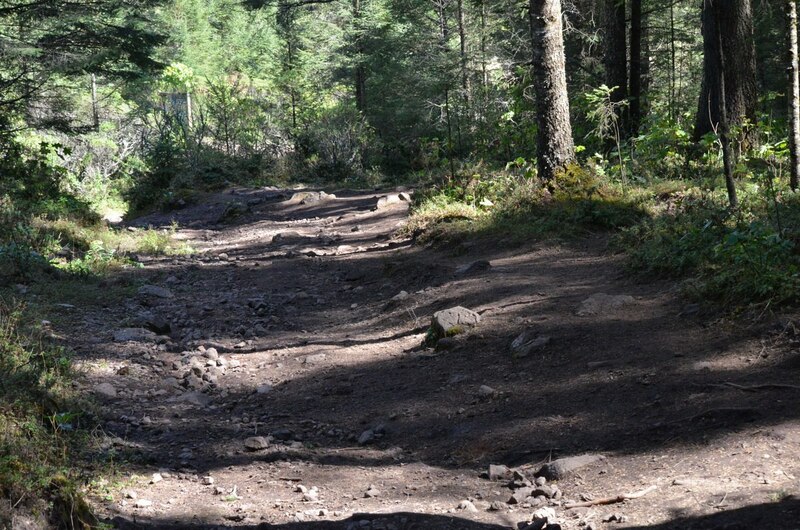 The trail was a well-worn dirt path, somewhat rocky and steep, but very easily managed with the assistance of our hiking poles. We had to be diligent and steer clear of loose stones to avoid rolling an ankle. 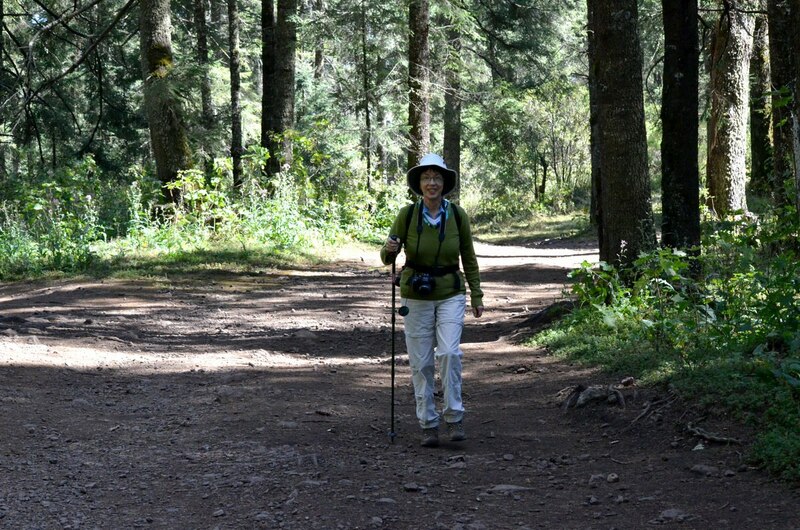 The ascent was less demanding than that at El Rosario Butterfly Reserve, and yet both hikes took us to an elevation of about 10,000 feet. The cool mountain air kept us refreshed even as the sun climbed higher in the sky. As the distance from the meadow grew longer, the trees multiplied until we were surrounded on all sides by a dense forest of soaring, arrow-straight pines that nearly touched the sky. 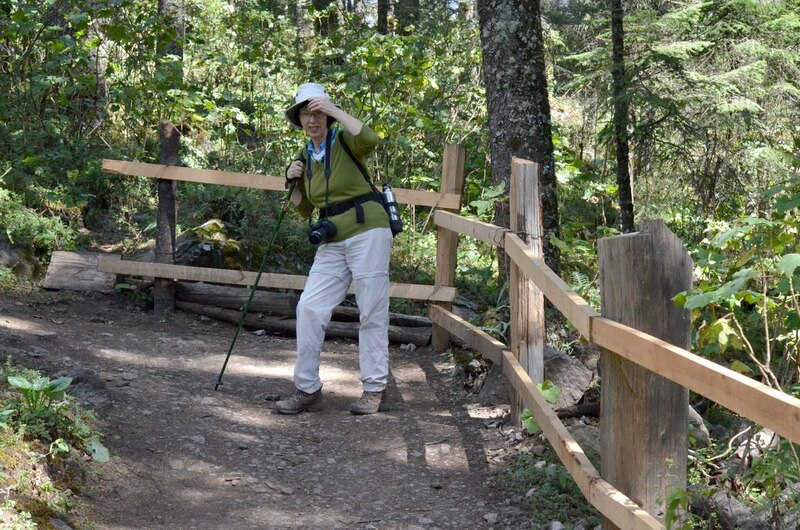 Two lookouts were constructed along the trail giving us a great overview of the neighbouring mountain valleys even before we got to the oyamel fir forests higher up the mountain. 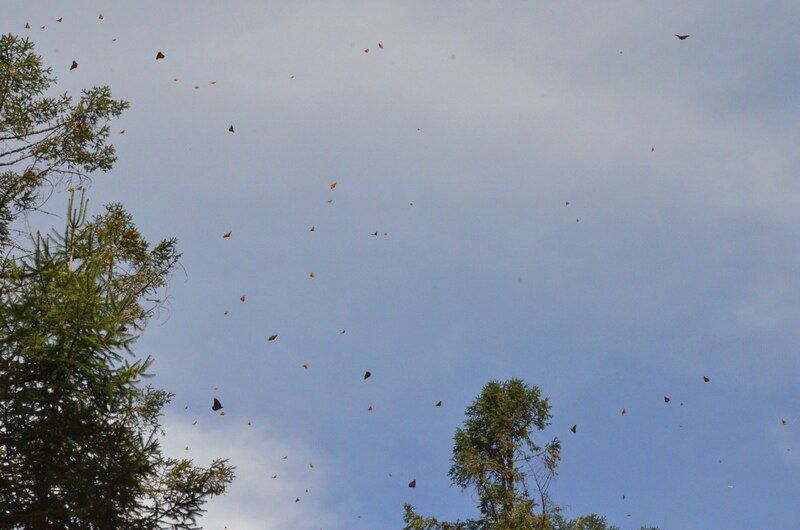 As if to welcome us to the butterfly reserve, several Monarchs drifted on the thermals just below the one observation point. I was diminished by the towering trunks that stretched upwards of 45-50 metres tall. As I tread softly at their feet, the top boughs sighed when bent by the light breeze. For me, that sound exemplifies a sense of isolation and oneness with nature whether in a northern forest blanketed with snow or there on a Mexican mountainside. 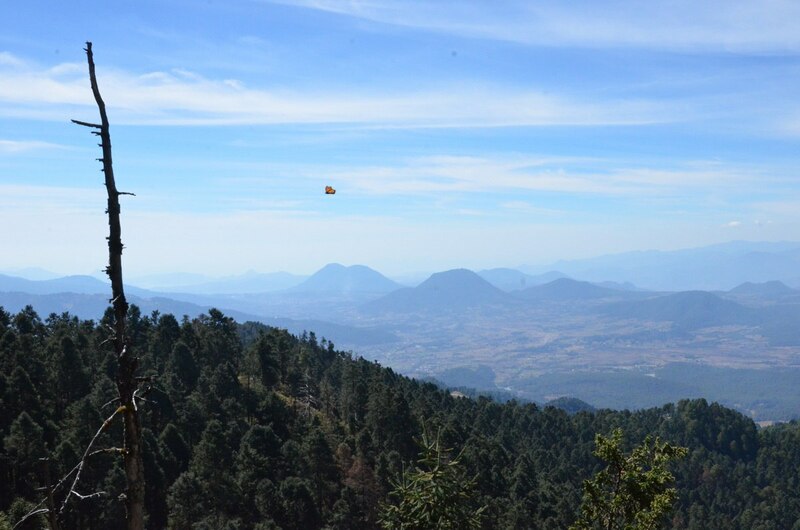 Of the habitats protected for Monarch Butterflies, those in Michoacan have the highest elevations with peaks that reach 2,700 metres above sea level (8858 feet). Within those habitats, a moist temperate climate dominates with an average daytime temperature of 22 Celsius (71 F.). 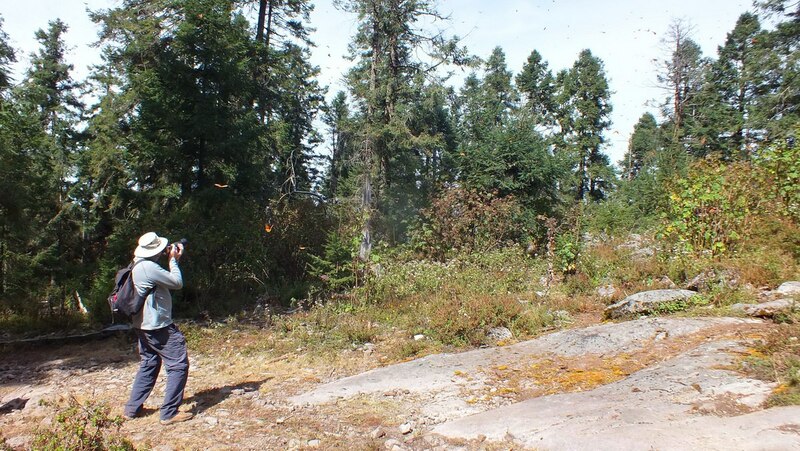 It is that cool and relatively moist habitat that is perfect for the Oyamel Fir Trees. 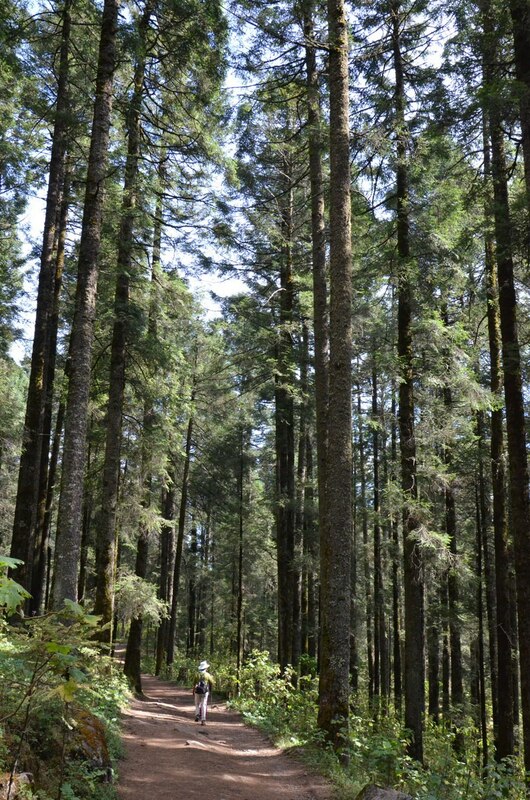 Oyamel Fir Trees require a cool, moist climate, which is why they grow at high altitudes where clouds can regularly envelop the mountains and trees. 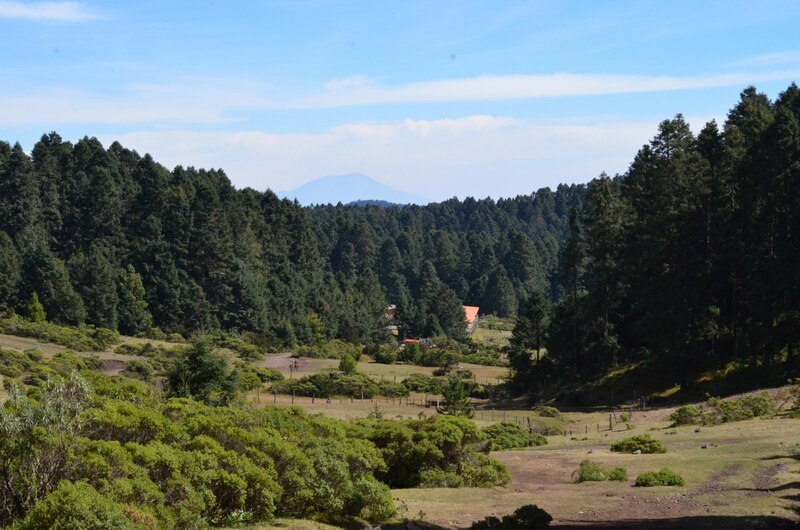 The cloud forest is therefore guaranteed a source of moisture especially during the dry winter season when lower elevations are too warm and dry. 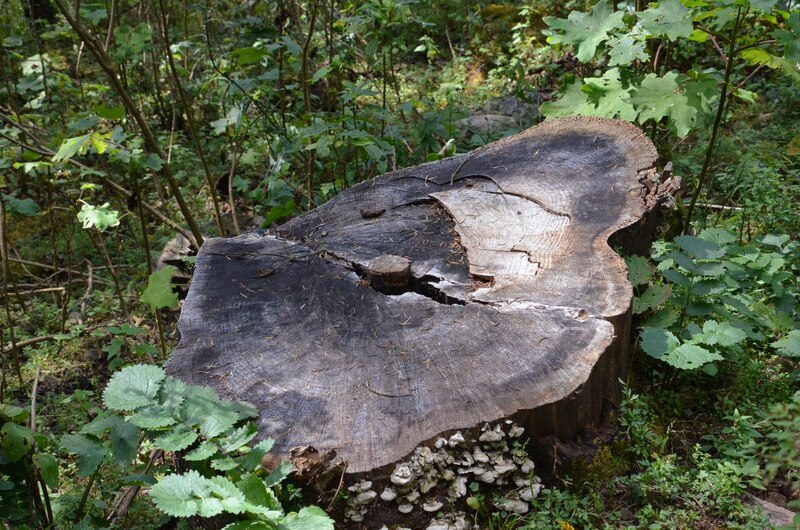 Along the hiking trail, Bob and I saw evidence of earlier forestry activity. 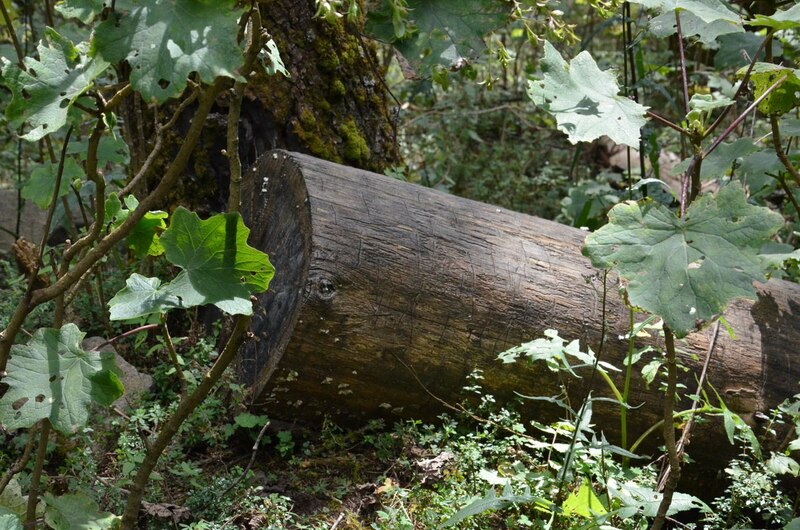 Some stumps and logs had a diameter of close to two metres (6.6 ft.). 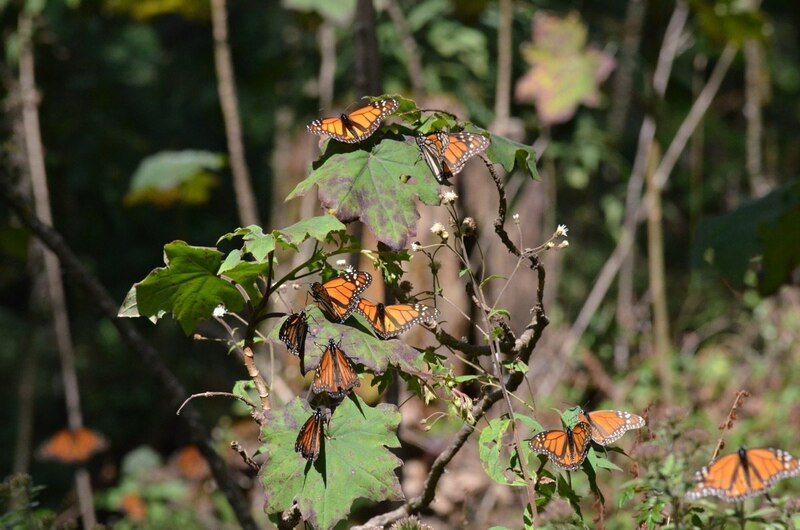 Although reforestation efforts are underway, scientists are still concerned about the thinning of the forest because it affects the delicate micro-climate that sustains the wintering Monarchs. 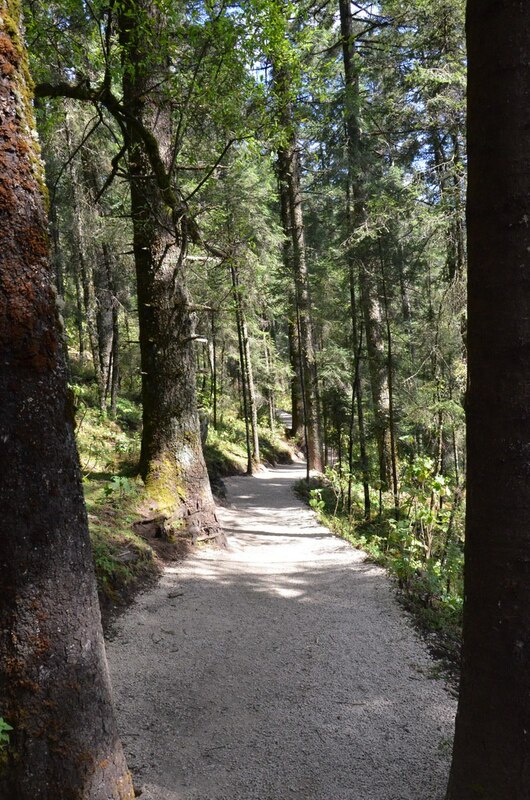 It was extremely pleasant walking up the mountain with so few other people on sight the day we visited. 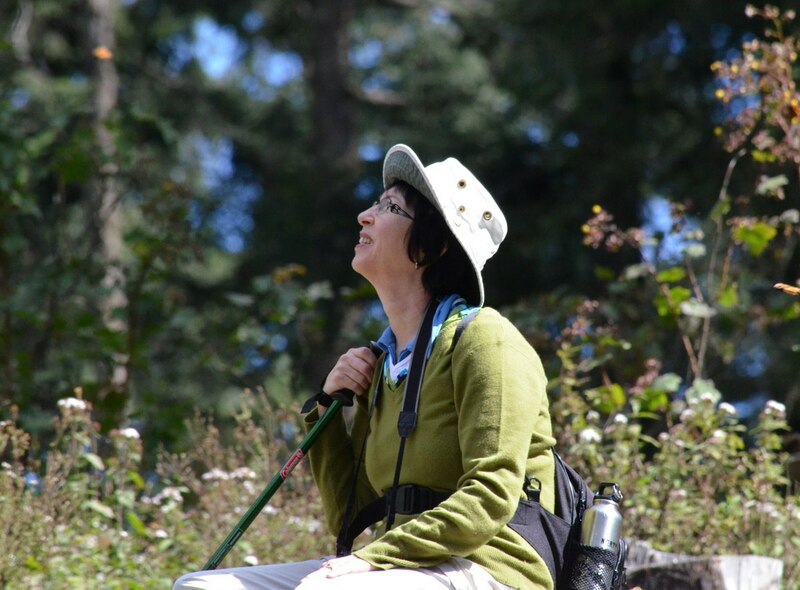 The trail was empty, the forest quiet for the whole climb allowing us to pause and admire native wildflowers and even discover a different species of orange butterfly. 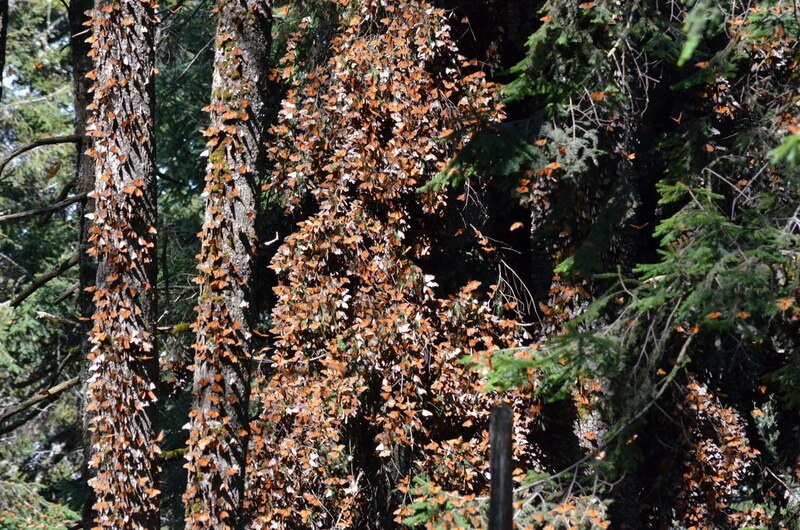 When finally we achieved the necessary elevation in order to see the Monarch Butterflies, the trail brought us very close to the trees wherein the orange beauties were resting. 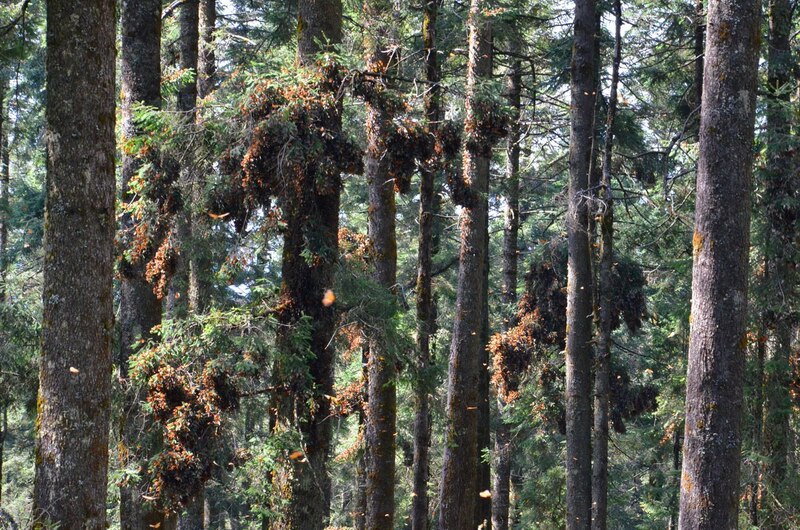 It seemed that there were not as many Monarchs visible from the cordoned off area as at El Rosario, but still the fir and pine trees were home to millions of the shimmering insects. 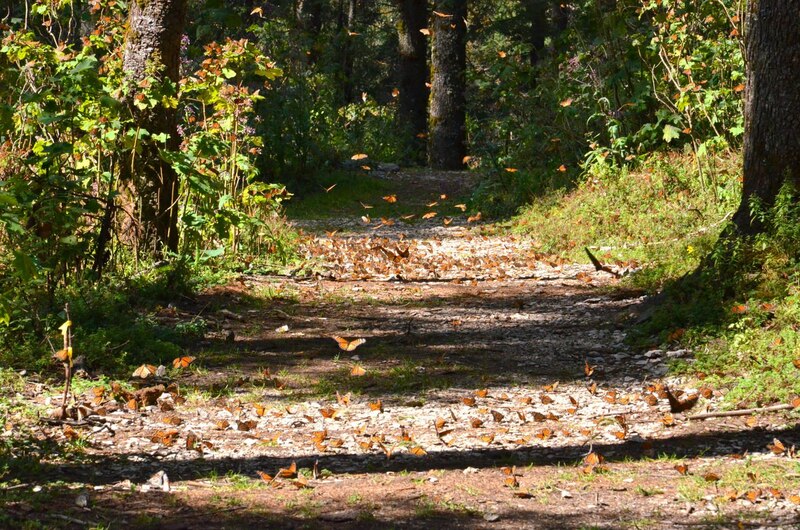 Ahead, on the forest floor, the air danced with the flutter of butterfly wings as hundreds of Monarchs vied for space on the damp soil. 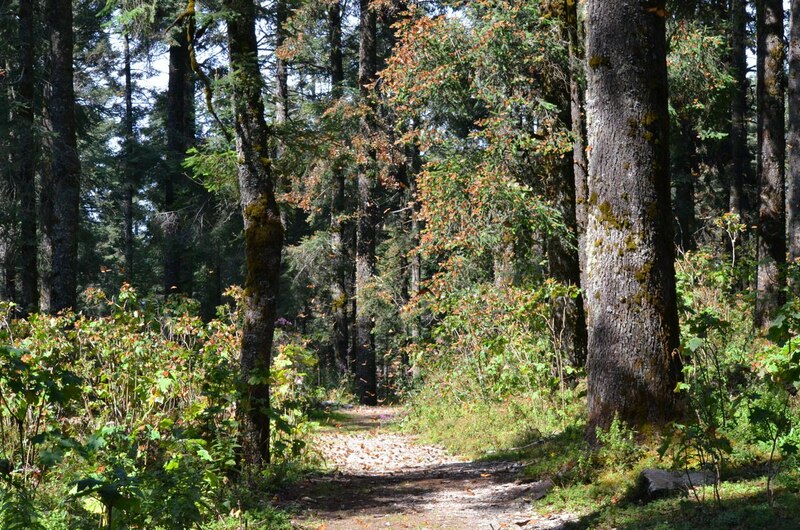 From one section of the colony to another, we carefully navigated the hiking trail so as not to trample any lethargic Butterflies still chilly from the night’s freezing temperatures. It was another blissfully sunny day so the Monarch Butterflies were extremely active. As they basked in the noonday sun, their wings seldom stood at rest but instead constantly vibrated to warm their bodies before the afternoon started to grow colder. 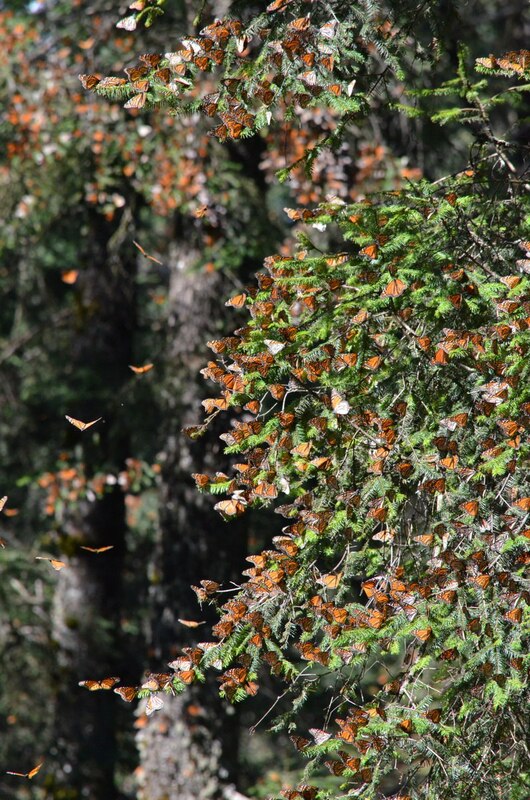 Like the Oyamel Fir Trees, Monarch Butterflies seek the cool, moist conditions in Mexico’s high mountain forests. The cool temperatures of the dry season actually help the butterflies conserve their energy by slowing down their metabolism so that they burn less energy. 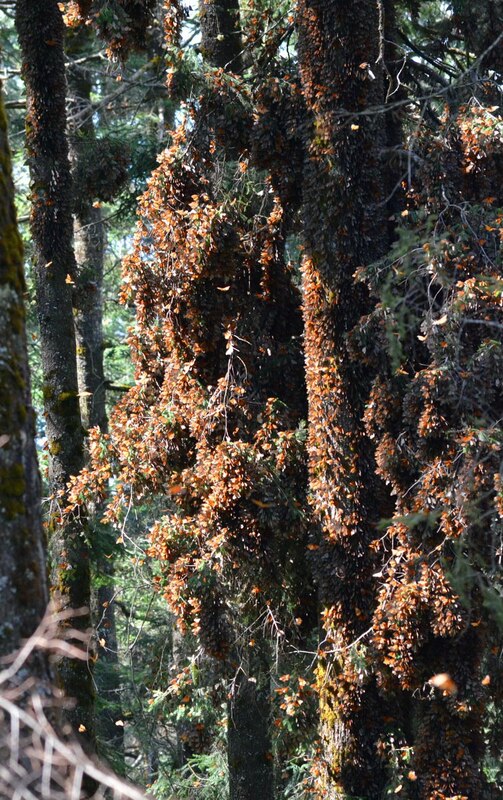 Because the nighttime temperatures at these altitudes can fall below freezing, it is imperative that the Monarch Butterflies return to perch en masse in the branches of the trees each night. Even if the mercury drops to as little as -6 Celsius (mid or low 20’s F), these delicate insects can freeze to death. To see so many Butterflies on one small section of a tree is beyond belief…truly magnificent. 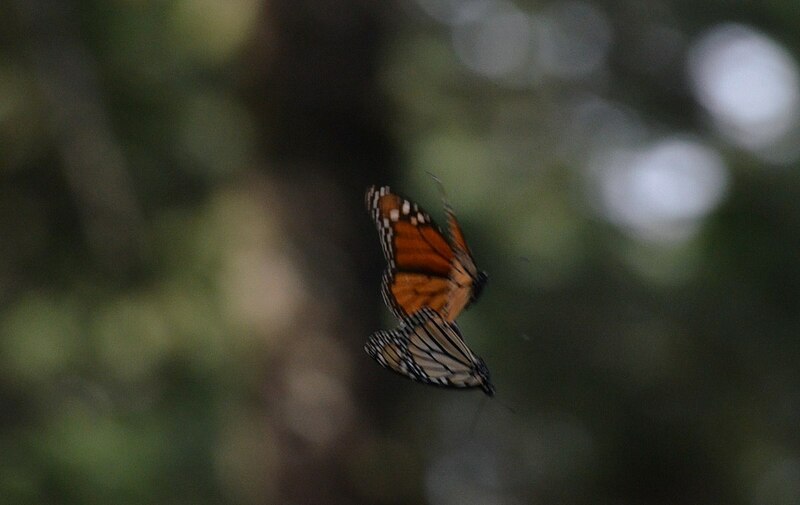 And where the weightless Monarchs congregate on outstretched branches, the accumulated weight of their tiny bodies pulls the horizontal surfaces down towards the ground. 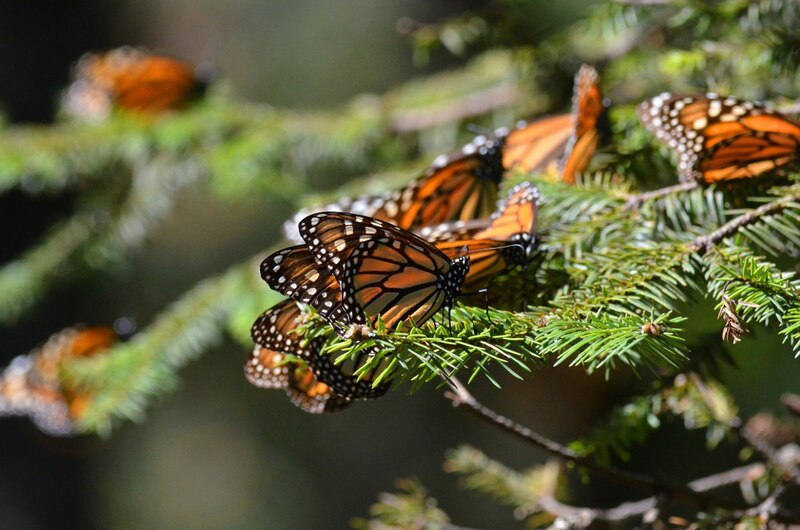 By clinging together in clusters on the Pine and Oyamel Fir Trees, the Monarchs keep each other warm by sharing their own body heat. 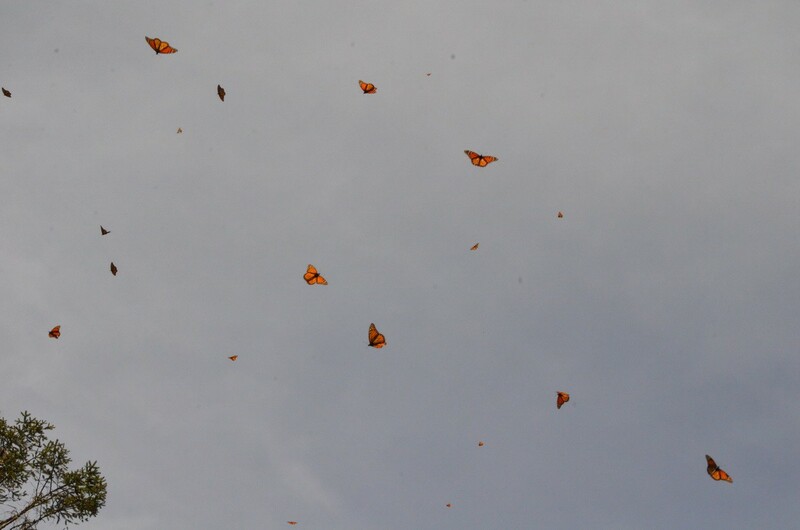 If the colony of butterflies is disturbed, the Monarchs will burst into flight filling the air with fluttering beacons of orange iridescence. 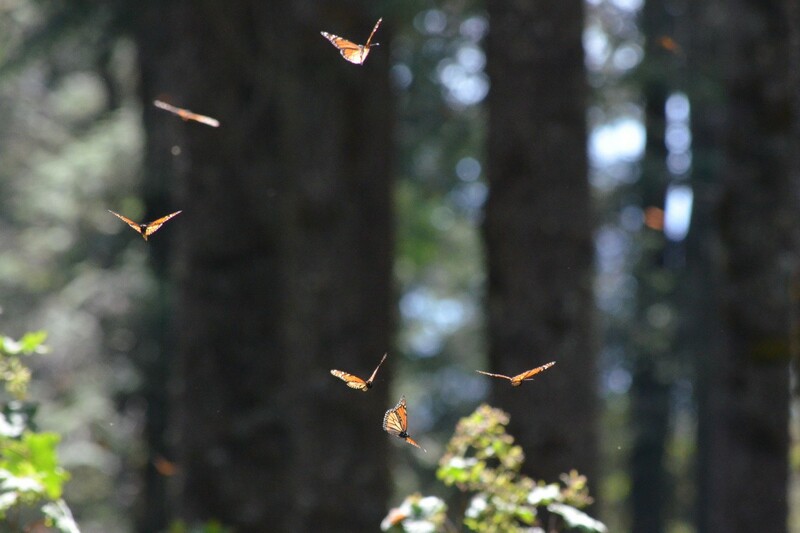 When a particularly huge bunch of the butterflies is in flight, the beating of their wings sounds like a light rain falling. 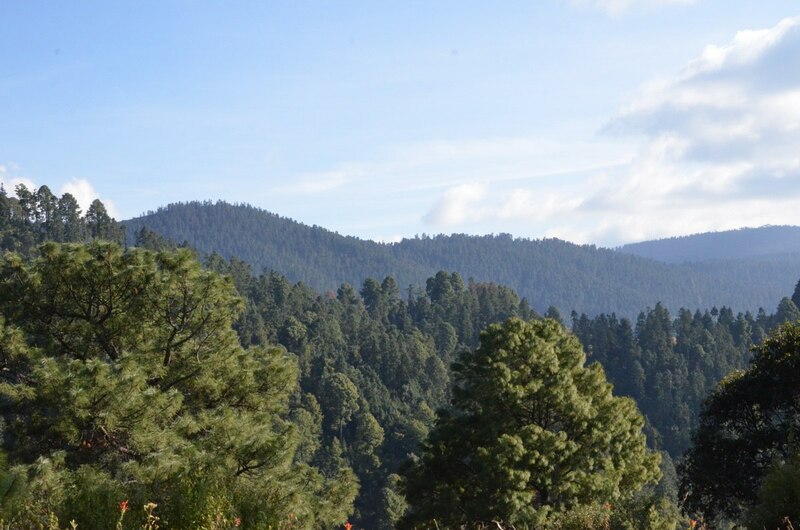 The Monarch Butterfly Biosphere Reserve, of which Sierra Chincua Reserve is part, is located in the Transverse Neovolcanic Belt (Trans-Mexican Volcanic Belt) so the terrain is rugged with outcroppings of basalt and many rock formations. 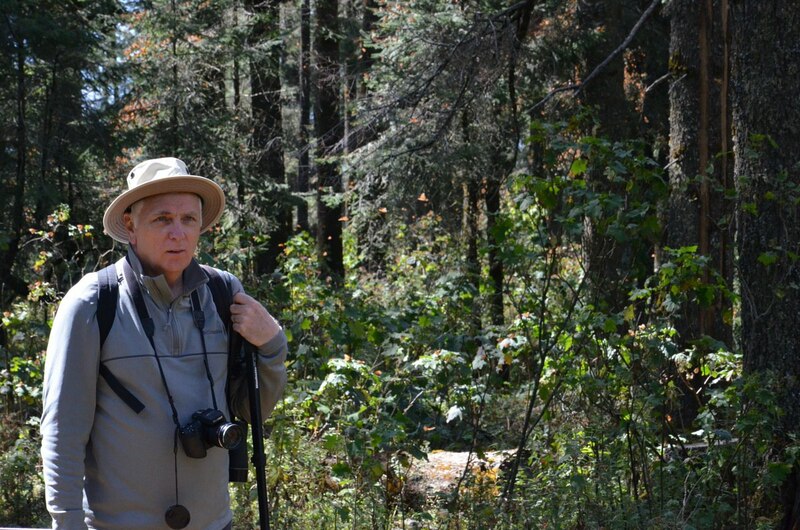 In an open area at the furthermost part of our walk, Bob tried to capture the volume of butterflies that took flight from a distant tree. Every time the blazing sun nudged the clouds aside, we were rewarded with a burst of activity. 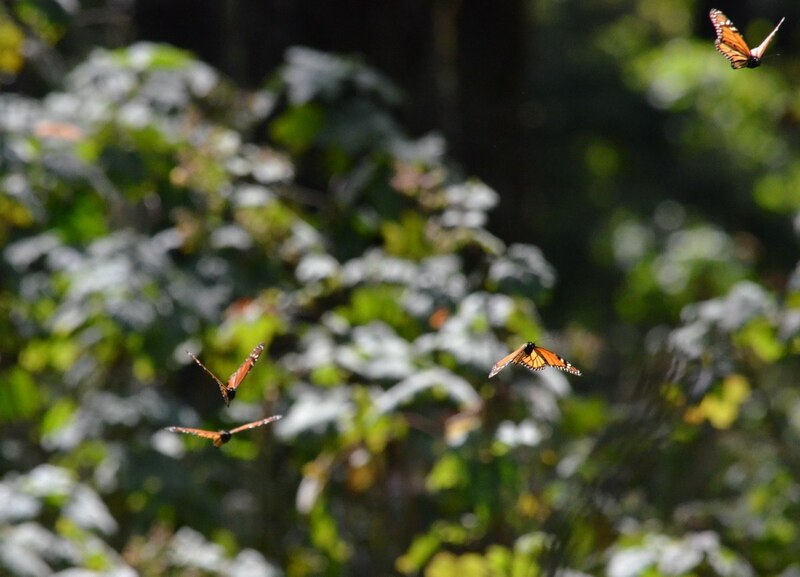 From the fringe of trees surrounding the open knoll, butterflies billowed up into the sky and flew towards us. Bob and I were in no rush to relinquish our grip on this once-in-a-lifetime experience. I settled myself on a large boulder and prepared to observe the activity around me. 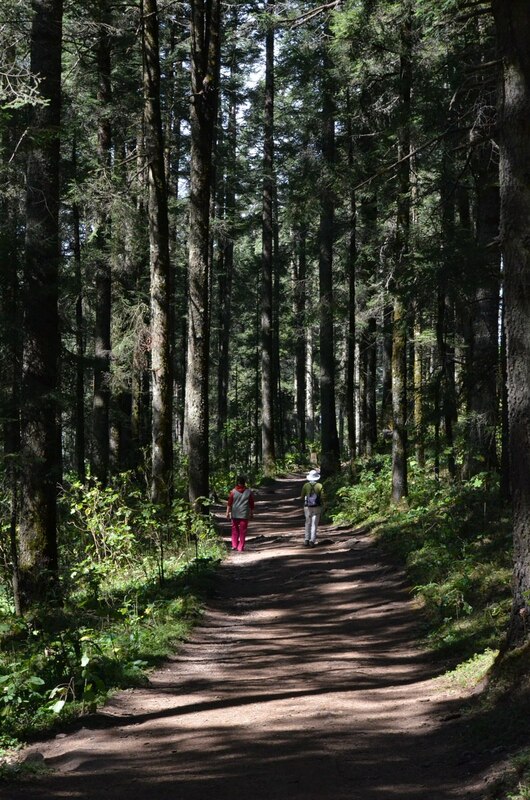 By this time, half a dozen other people had crept up behind us on the trail, but everyone was mindful of the “no talking” rule, so excited whispers were heard all ’round. When my hiking stick accidentally clanged against the rock, I uttered a quick and sincere apology. Oops! 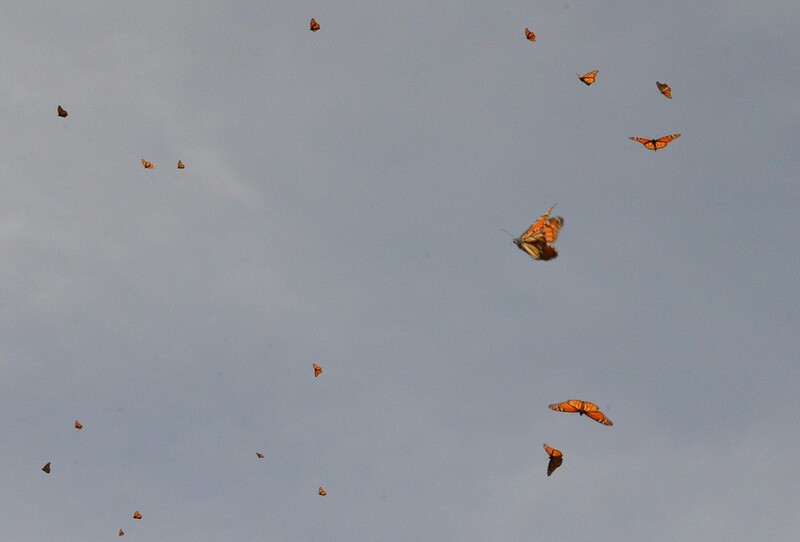 Every few minutes, I found myself at the center of a swirling mass of delicate Monarchs on the wing. I was like a sponge soaking up the experience, and that gave me the idea for a perfect analogy to describe the movement of the swarms of butterflies. It was like I was looking up through schools of colourful tropical fish backlit by rays of sunshine where they penetrated the ocean’s surface, only, in this case, it was waves of butterflies undulating on the gentle air currents before they settled on nearby flowers and bushes. 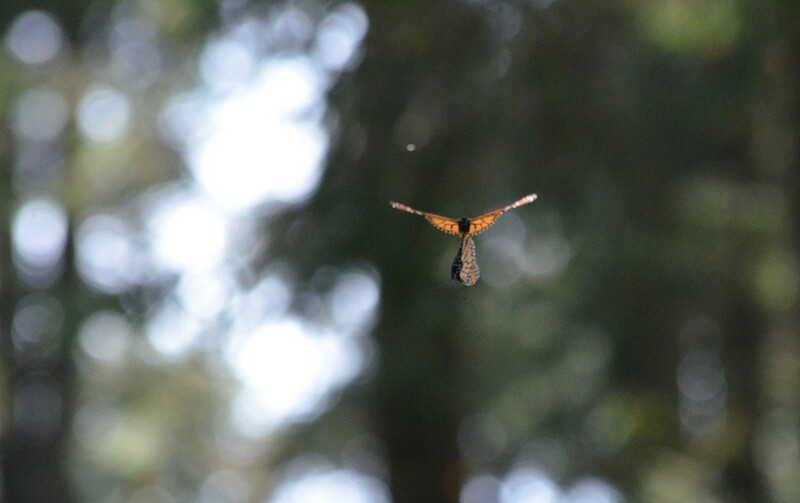 Out of the millions of butterflies flitting around, Bob happened to spot one pair that were flying tandem, obviously paired in the act of copulation. 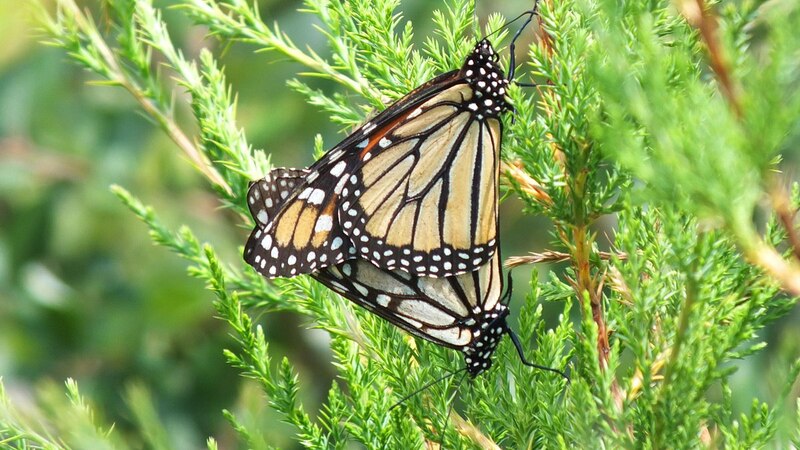 A pair of Monarch Butterflies that are mating will fly together for a period of several hours during which time one of the butterflies will fly and the other is carried along. 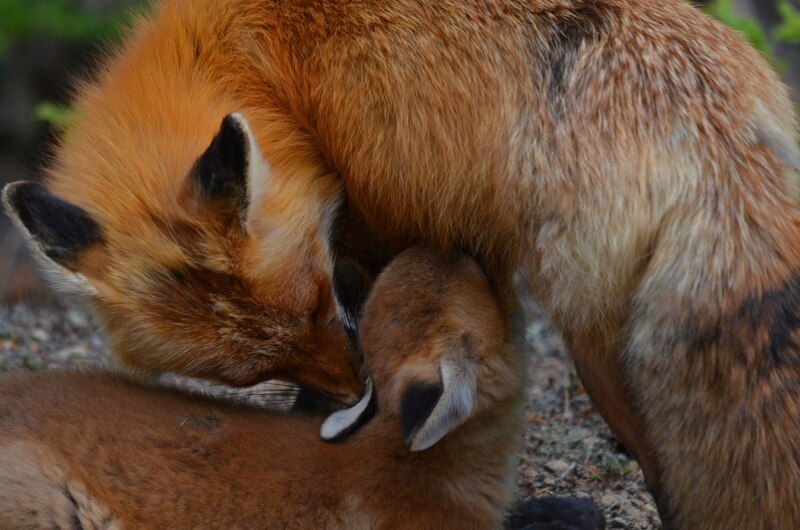 It is the tips of their abdomens that are joined together . This past summer, Bob and I observed a pair of Monarch Butterflies in the process of mating near Lower Reesor Pond in Scarborough, Ontario. They began by perching on a low bush but then took flight together. 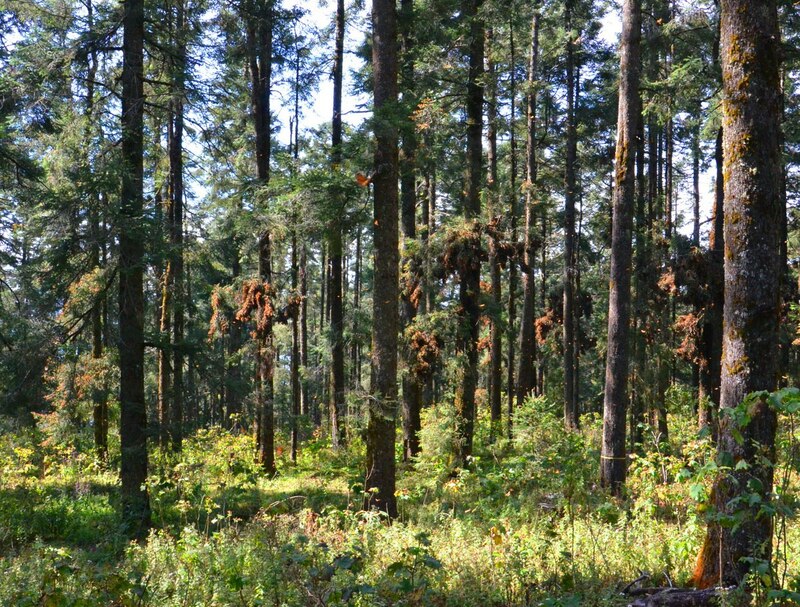 Twelve isolated mountaintops represent the overwintering sites of the Monarch Butterflies, but a mere two percent of the original Oyamel Fir Forests remains. This is partly owing to mass logging but also to climate change. 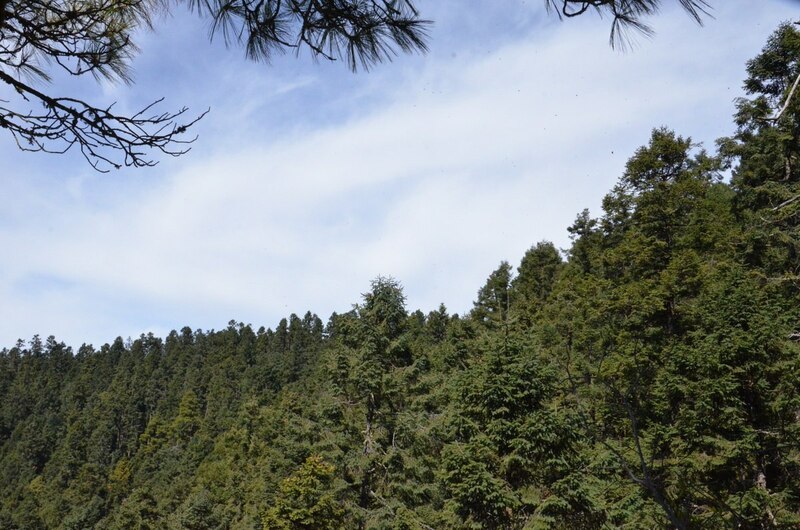 With warmer temperatures, the Oyamel forests have retreated further up the mountainsides to escape the warm, dry conditions of the lower elevations. 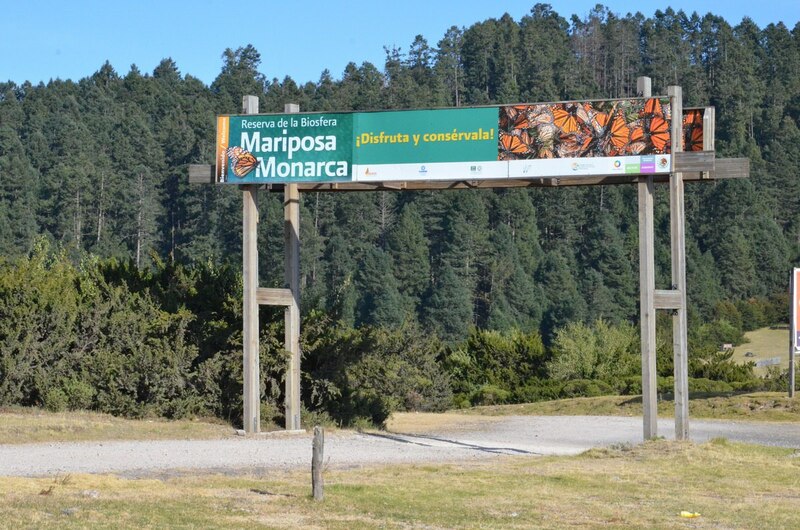 So, there, at Sierra Chincua Reserve, one of the two Monarch Reserves in the State of Michoacan open to the public, Monarch Butterflies find the necessary habitat to while away the winter months. At rest, the Monarch Butterflies, for the most part, keep their wings folded together thus revealing their paler undersides. 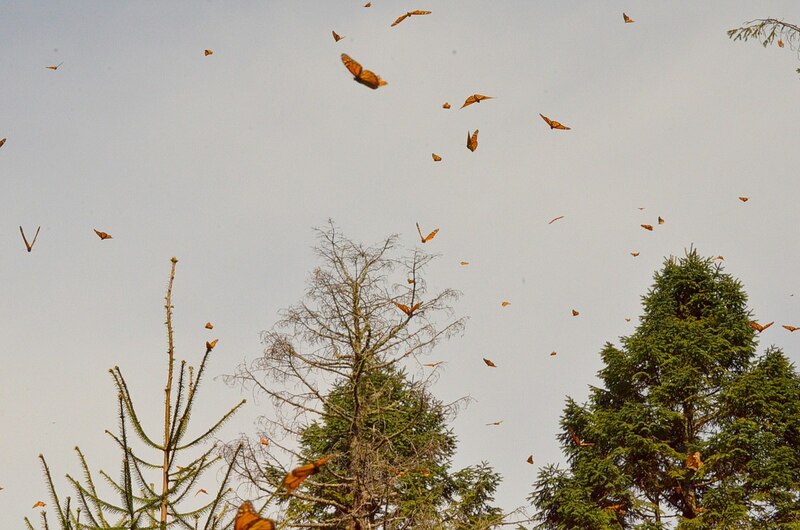 When we first looked at the trees weighed down under the Butterflies’ weight, it looked like they were covered with dry, dead leaves. Sporadically, some of the roosting Monarchs flutter their wings or readjust their perch and in so doing reveal the full glory of their orange upperwings. Either way, the sight is a marvel of nature. For me, the migration and conglomeration of these regal insects is a natural phenomenon that is the most dramatic manifestation of mass insect migration on the planet.